TORONTO – D.J. Augustin has never been universally celebrated as one of the great shooters in today’s NBA, even though he has the resume and the raw statistical data to back up his case. The Orlando Magic’s 11-year NBA veteran has never been mentioned in the same breath as NBA sharpshooters Stephen Curry, Klay Thompson, Kevin Durant, James Harden or Chris Paul, but he has a picture-perfect form and release that look as if they were culled straight from an instructional video. And while Augustin is often the smallest player in a game filled with giants, his confidence level, grit and belief in himself belie that of a 6-foot, 183-pounder. All of that proved evident on Saturday when it came time to win Game 1 of the first-round playoff series between the seventh-seeded Magic and the second-seeded Toronto Raptors. Sensing confusion among two Toronto defenders, Augustin confidently let fly a 28-foot 3-pointer that was so true that the net barely wiggled as the ball sailed through. That 3-point dagger with 4.2 seconds remaining simultaneously silenced the 19,937 fans barking at him at Scotiabank Arena and lifted the underdog Magic to a stirring 104-101 Game 1 victory. On Sunday, nearly 24 hours after the biggest shot of his career, Augustin’s confidence was just as strong as when he drilled the game-winner. Augustin, 31, had good reason to believe the clutch, game-winning shot was going in – even though he had to put it up over 7-foot center Marc Gasol and with two-time Defensive Player of the Year winner Kawhi Leonard in the vicinity. During the regular season, Augustin ranked 12th in the NBA in 3-point shooting percentage (42.1 percent). An even more telling statistic is the stellar percentage that Augustin has shot from 3-point range off the dribble – as was the case on Saturday when he dribbled four times before sinking the three that will go down in Orlando playoff annuals. His 38.9 percent accuracy this season on pull-up 3-pointers ranked fifth in the NBA behind only Curry (41.5 percent), Tobias Harris (41.3 percent), Thompson (40.9 percent) and Khris Middleton (39 percent). From there, Vucevic – Orlando’s leading scorer and rebounder all season – brought up one of the driving forces behind Augustin’s game. Before the Magic ever bounced a ball in training camp in September, there were rumblings about whether he was good enough and durable enough to be the Orlando’s point guard over the 82-game haul. And, to some, the Magic might be at a major disadvantage every night with Augustin running the point against the star power at the position throughout the NBA. Of course, Augustin proceeded to prove those critics wrong – just as he’s done his whole life as a relatively tiny player. He more than acquitted himself throughout the season by playing in 81 games and posting some of the best numbers (11.7 points, a team-best 5.3 assists and 2.5 rebounds a game) of his career. On Saturday, he not only tied his career high for a playoff game with 25 points, he dominated his matchup against all-star point guard Kyle Lowry (zero-for-seven shooting, zero-for-six from 3-point range and zero-for-two from the free throw line). Saturday’s performance, Vucevic insisted, should finally answer questions that have dogged Augustin for years. In some ways, a case could be made that Augustin epitomizes the underdog Magic in this first-round playoff series. Facing a loaded Toronto roster with several former all-stars and NBA champions, Orlando has been given little chance at all to be competitive. Once 20-31 on the season, the Magic needed to go 22-9 over the final six weeks just to get into the playoffs. Also, the Magic have needed to rally in the fourth quarter to win 11 times – the second-most victories in the NBA when trailing after three periods. 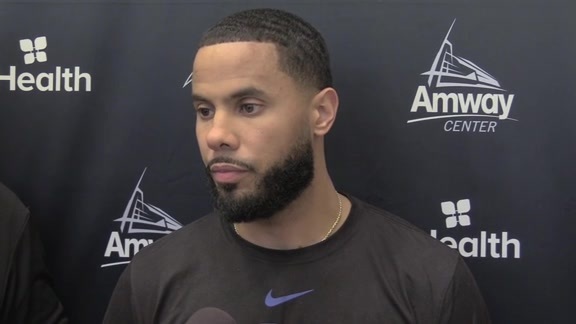 Augustin said the Magic being in the crucible of so many back-to-the-wall, must-win situations late in the season readied them for the white-hot intensity of the playoffs. Augustin was so dominant on Saturday that he allowed the Magic to win even as usual stalwarts Aaron Gordon (10 points on three-of-10 shooting), Terrence Ross (10 points on two-of-11 shooting) and Vucevic (11 points on three-of-14 shooting) struggled offensively. For the game, the Magic shot just 40 percent, but they made 14 of 29 3-point shots and 18 of 20 free throws. During the regular season, Orlando went just 5-18 when shooting worse than 42 percent from the floor and it was just 7-10 when Vucevic had 15-or-fewer points. Augustin had more room to operate because Toronto was determined to take away Vucevic and Ross, sending double teams at the 7-foot center and crowding Ross’ airspace so that he couldn’t shake free for clean 3-point looks. Augustin took advantage, making nine of 13 shots, four of five 3-pointers and three of four free throws while also chipping in six assists, two rebounds and a steal. Also emblematic of Augustin’s steadiness all season – when he tied for 12thin the NBA in assist-to-turnover ratio (3.33:1) – he turned the ball over just once in 29 minutes. Toronto countered by using the 6-foot-6 Danny Green on Augustin in the fourth quarter only to see the Magic point guard drive around him for the tying layup inside the final minute. On what proved to be Orlando’s final offensive possession of the night, Raptors head coach Nick Nurse put Leonard – who is universally considered to be the NBA’s best perimeter defender – on Augustin with the score knotted at 101. However, when Leonard was screened by Vucevic, he passed the point guard off to Gasol. That’s all Augustin needed to see to know that he had a big matchup advantage and he responded by drilling the biggest shot of his career. 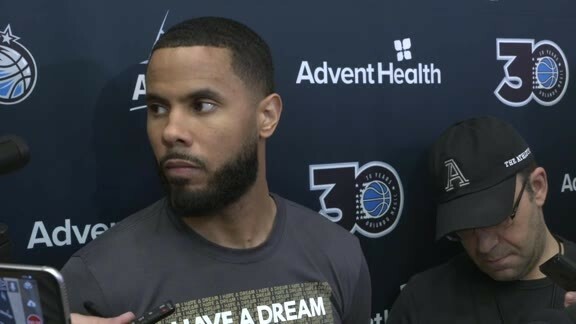 Not long after capping his stellar night with the winning 3-pointer, Augustin said his phone was flooded with messages from the family and friends who always stuck by him when others doubted whether he could be a difference-making point guard. On Saturday, the supposedly too-small and too-fragile Augustin once again proved himself to be an elite shooter and a player fully capable of driving Orlando to success. After all, Augustin said, winning is the ultimate answer to those who continue to doubt him and the underdog Magic.